Meet the girls! This is my favorite vacation picture. 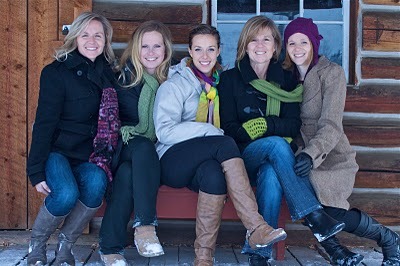 From left to right: my sister, my two sisters-in-law, my mom, and then me in the hat. These are the women that remind me it’s NOT OKAY to go a week without showering, or to wear my electric orange University of Tenessee pajama pants all day long, or to cut my own hair. Just because I live a whole country away, it’s still NOT OKAY. I don’t know where I got my less-than-classy tendencies from, but without this bunch, I’d probably be digging through a dumpster right now looking for furniture or lunch or both. So vacay was a success. I bought jeggings, I got my fill of cold for the decade, I ate a lot of chocolate and remarked that it would be fun to go for run if there wasn’t several feet of snow on the ground, and I saw a bull moose close up. Mostly, it was fun just to talk to the people that understand me best. Favorite conversations: 1. Plastic surgery (Lift or tuck or both? Botox–yay or nay or forehead only so you don’t look like one of the Housewives of Beverly Hills?) 2. How much you’d pay to punch a Kardashian 3. Whose husband is the most troll-like. Just kidding, there was surprisingly little man-bashing to be had. Maybe next time. And now I’m battling post-vacation blues. My four and half hour dentist appointment didn’t help any—for the first time in my life I actually cried in the chair. Don’t judge me. It was bad. You would have cried too. The good news is I only have one more appointment to go, and then I’m done until the next major catastrophe. I should be back on solid foods in no time at all. I’ve SEEN the cover photo of Virtuosity! It exists. It’s beautiful. I’m dying show it to everyone and their dog, even strangers who don’t give a crap and their dogs too, but it’s still top secret so all I can do is be annoying and brag about having a secret. It’s kind of bizarre that I even have something top secret to allude to. I mean, it’s me. Top secret refers to Christmas presents, or that mirror I broke when I was thirteen and then hid under the bed because I knew my mom was going to freak out about it (genius move, I know). I know my book cover is not a matter of national security. Probably nobody getting water-boarded if it gets leaked (at least I don’t think so, but really, who knows what they’re up to at Simon & Schuster? ), and yet I can’t tell. So…na-na na-na boo boo? That doesn’t seem like top secret protocol. Clearly, they should have given me better instructions. Lastly, the WIP is making me really happy right now. I’m in that place where I daydream about my characters like they’re real people. I love the way the story is unfolding, I love the direction the characters are moving, and all that’s a relief because it would be a shame if I had to kill everybody off. Deep down I kind of like unsettling endings, but not that unsettling. Besides, I have a feeling my editor/agent/every reader in the world might object to that kind of thing, so I guess it’s good I don’t feel the need to actually kill them. Anybody else like a good bad ending? What’s the matter with me? Feel free to answer either of those questions, either in the comments or just to yourself while you’re shaking your head with disgust. 5. Team Edward vs. Team Jacob wrestling match. Losers get thrown in the lake. That last one is a whole lot funnier if you know the participants and can picture the hair pulling. I’m just going to save myself the hassle of getting disowned and clarify now that MY MOM NEVER SWEARS, and MY BROTHERS ARE NOT MORONS. Oh, and also there is a Santa Clause, and Edward isn’t a jerk. I got the green light for Book 2!!! I sent the first three chapters and synopsis to my editor a couple of weeks ago, and got the good news last week. Sweet relief! This means I don’t have to hurl my computer off a building, buy a new computer, and then start writing a new novel. I’ve put way too much time and love into this new book to be zen about a rejection, so yay! I feel like I can finally take a deep breath. By the way, this book (and I hope “this book” isn’t my final title) will be out in fall of 2012. On an awesome note, looky here at what Anica-the-nicest-editor-in-the-world sent me? I call this face the half-blinky. Tyra doesn’t teach it on America’s Next Top Model because you’re either born with it or you’re not. Anyway, Anica felt bad for me because I’ve had a horrific two-week run of dental trauma (crown, crown, root canal, molar extraction,dry socket, bridge, and probably more coming up). Or quite possibly she just wanted me to shut up already about my teeth on Twitter. But for real, what else am I going to tweet about? Forgetting to pick up my kid at the bus stop? Check. What I’m eating? Check. Sister Wives wanting to make my head explode? Check. I’ve tweeted about all of those things, because whatever I feel passionately about at the moment is what ends up in that little box. I have great respect for writers who are able to use Twitter as a marketing tool and come off cool (there are lots who do it well), but I really feel like spewing randomness is more my style. Especially when my oral surgery comes along with a fancy prescription. Maybe someday I’ll grow up enough to tweet significantly, but until then it will continue to be my ranting receptacle. I must say, it feels like good therapy. If you haven’t tried, give it a whirl. VIRTUOSITY, fresh from copyedit land, ready for me to work my way through! I felt like a starving five-year-old who’d been given broccoli and a candy bar, and told do the right thing. Since I was the loser kid who ate the broccoli first just in case someone was watching, I forced myself to go through the entire copyedited manuscript in one sitting last night. SURPRISE: not at all painful! It was kind of fun actually, mulling over commas and semicolons into the wee hours of the night. The only lame part was discovering that I have no idea how to use lay/lie/layed/lied/laid/lode/liederhosen properly, and now a whole string of people at Simon Pulse know that too. I am ashamed (but not too ashamed to admit it here, apparently) that I looked it up every time I used it, so I actually thought I was using it correctly. Thanks for nothing, Google and my English degree. Just kidding kids, stay in school. So now I can read my books guilt free, as soon as I write the acknowledgments and dedication. Easy. I’m acknowledging my dentist, my endodontist, and my oral surgeon. And the dedication…um, actually I’m putting that on ebay. Bidding starts at $5. Don’t be stingy.